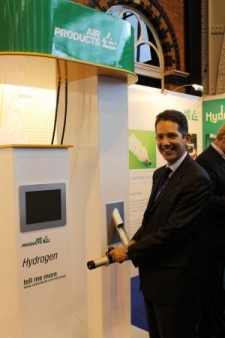 Jonathan Djanogly Member of Parliament for the Huntingdon Constituency got the chance to experience hydrogen transport technology, which will be on our roads by 2015, at the Conservative Party Conference in Manchester. Demonstrating that hydrogen fuelling technology is ready and waiting to be deployed across the UK, Air Products brought along their award-winning hydrogen fuelling station for Jonathan to test out. Jonathan also got the opportunity to see firsthand Riversimple’s Mk1 local car and the Intelligent Energy zero emission ENV hydrogen fuel cell motorcycle. Chatting with hydrogen energy experts such as Diana Raine, Hydrogen Energy Business Manager for Europe - Air Products, Jonathan used the opportunity to understand how hydrogen works as a transport fuel and learn more about what a UK hydrogen transport network would look like. Hydrogen vehicles emit no harmful emissions, and can compete with conventional petrol and diesel vehicles in terms of speed, range and fuelling times. Riversimple’s Mk1 car has a range of 240 miles per tank of hydrogen and a refuelling time of only three minutes, while Suzuki’s hydrogen powered Burgman motorscooter using Intelligent Energy’s next generation fuel cell powertrain is expected to retail for less than €8,000 when released in 2015.